"Executives and HR managers know coaching is the most potent tool for inducing lasting personal change." Business coaching is the process of helping a company or business team achieve greater clarity, focus and results. It is similar to life coaching but it takes place in a business setting and opposed to being focused on an individual's goals, it is typically centered around the goals of the business as a whole and its success. Regardless of the size of your business, whether you are a solo entrepreneur, a small business or a Fortune 500 company, business coaching is aimed at improving the performance of your people and increasing the company's bottom line. Here at Noomii, we help both individuals and corporations get matched with their ideal coach(es). To learn more about our personal or corporate coach matching service, scroll toward the bottom of this page. A common misconception about business coaches is that they are business experts. 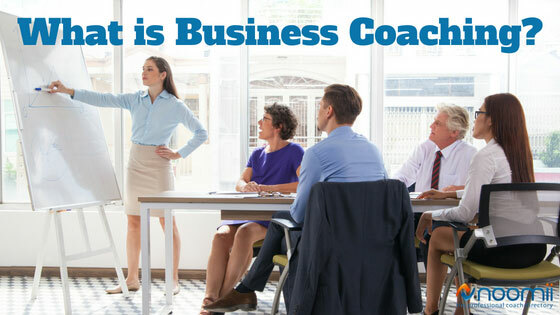 While many business coaches possess extensive business knowledge and experience, they need not be experts in your line of business to deliver quality coaching services. The underlying philosophy of business coaching is that the individuals within the company participating in the coaching, whether you are the CEO or the front-line staff, are the experts in your business. The role of the coach is to help you come up with your own solutions, strategies and an action plan for improving the business. Business coaching, as opposed to personal life coaching, has the advantage of an easily measured benefit - profitability. All business coaching is aimed at increasing the bottom line of the company by increasing revenues and/or reducing costs. Coaching can do both, if done right. Cutting edge companies know and understand the value of their people and invest in their performance, well-being, and professional development. They understand that a happy workforce is a more productive one. Coaching is one of the best tools available to companies to bring about change and transformation in their people. According to the ICF Global Coaching Client Study, published in 2009, clients who received business coaching reported several business improvements, including better teamwork, more clarity of goals, and better communication. According to the 2009 ICF Global Coaching Client Study, "Several focus group participants indicated that, prior to experiencing it themselves, they had negative perceptions of coaching and the people who use it. In many cases, it was perceived to only be for people with problems or those who can’t 'do it on their own' rather than a tool that can help people excel and teach them new skills. Importantly, while participants in the focus groups did hold some negative views on coaching prior to commencing coaching themselves, these negative views were dispelled once the coaching process started and all ended up viewing the process positively." Business coaching is for companies or organizations that want to invest in the growth and development of their people. They see business coaching as a strategic initiative to improve the corporate culture and be more successful. To steal the phrase of the popular business writer Jim Collins, business coaching is about going from Good to Great! That said, business coaching is often sought to remedy a specific pain within the organization such as high worker turnover, decreased morale, employee burnout, poor communication, or decreased sales. All of these issues can be addressed with a well designed coaching program. Depending on the needs and goals of the company, business coaching programs can be created to directly impact top-level executives, middle managers, and even front-line staff. Business coaching for senior executives is commonly referred to as executive coaching or leadership coaching. During the 70s and 80s when business coaching was in its infancy, the first individuals to receive coaching were senior executives. This is often still the case. Companies invest in coaching for their executives because they are the highest paid individuals in the company and the ones responsible for creating change within the organization. Business coaching for middle managers is commonly referred to as leadership coaching because the intention of the coaching may be to improve the middle manager's ability to lead or to prepare the middle manager for an upcoming ascent to a more senior role. Business coaching for middle managers may also be part of a more comprehensive team coaching initiative which gained in popularity in the mid 2000s. Business coaching for front-line staff is sometimes referred to as performance coaching, or as team coaching if delivered as part of a group initiative. Measuring the return on investment (ROI) of business coaching is a hotly debated issue. Traditionally, it has been difficult to demonstrate an increased value of a company's human capital. The knowledge and value of coaching is growing and clients are increasingly demanding that rigorous methods be employed by coaches to measure the impact of coaching. Clients want clear statistical evidence of the bottom-line value of coaching and they want coaches to better justify the methodologies they employ. The challenge is that the cost/benefit analysis of coaching is not easily made because the outcomes produced by coaching may not be easily measured or directly attributable to coaching. For example, a coaching initiative may improve team communication which then stimulates more innovation. How is that innovation measured? Would the company's best ideas have been generated without the coaching? Furthermore, coaching initiatives are not usually implemented in isolation. If the company grows revenues by 25% during the time that coaching initiatives were employed, what other initiatives were taken during that time? profit increases such as higher throughput, increased sales, sales by department, cross-division sales, etc. cost savings such as decreased inventory, lower cost per lead, less management, etc. Once you've determined the metrics you want the coaching to affect, collect baseline data against which you can measure the benefits of the coaching. If you are in the process of hiring a business coach for your company, be sure to cover the topic of measuring ROI in detail. For large organizations, a coaching consultant is often the first person to come on board prior to delivering coaching services within an organization. The coaching consultant is an expert coach that can perform a needs assessment for your company or organization and advise you in creating a coaching program that meets your requirements and budget. The coaching consultant may also be essential at getting all the major stakeholders to buy-in to employing a coach-approach in your company. Once a coaching program is developed, a business coach executes on the coaching plan. The plan may include any number of coaching initiatives such as one-on-one coaching, group or team coaching, and / or coach training. Depending on your needs, the plan may also include a variety of coaching related services that many business coaches offer depending on their skills, education, and training such as facilitation, mediation, organizational development, strategic planning, and more. Many individual coaches or coaching companies offer both business coaching and coaching consulting services. You may want to hire one individual or company to deliver all of your coaching needs or you may want to hire separately to make sure the coaching consultant can remain unbiased and doesn't have a financial incentive in recommending specific coaching initiatives. The difference between small business coaching and business coaching for large companies is in scale and complexity. Regardless of size, all companies have a financial motive for using coaching. The major difference, having spoken to both small business coaches and their clients, is that many small business owners will also rely on their business coaches for expert business knowledge in addition to the coaching. Small business owners don't always have the luxury of big budgets and employees with specialized skill sets. Therefore, if a small business coach can also offer expert knowledge, they can get more benefit from a single relationship. For example, a small business owner may hire a coach who is an expert in social media marketing, writing business plans, project management, human resources, or any number of other areas. Interested in finding a business coach for your company? Browse our extensive directory of business coaches now or request a coach. The most important thing to remember when looking for a business coach is to find one whose training, background and skills most closely match your specific goals. There are many coaches with many different specializations, and your ultimate success will largely depend on finding the coach with the best “fit” for your particular situation. Because finding the right fit is so important, it’s critical that you not just hire the first coach you talk to. Instead, we recommend you speak with at least 3, and ideally 4 or 5, to find the one who you’re going to feel the most comfortable working with over a period of several months. Almost all professional coaches offer a free, 15 or 20 minute consultation to help you determine if they are the right coach for you. If you’re fairly sure about what you’re looking for in a coach, you can find a list of hundreds of coaches with several specializations in Noomii’s directory of professional business coaches. However, if you’re not sure exactly who you should be coaching with, you can request a coach through our Referral Program. With this service, you tell Noomii about your goals, background, and budget, and we send you a select list of compatible coaches to interview for your free consultations. Are you in a management position looking for coaches for your company? Are you having a hard time finding and knowing which business coaches would meet your needs? That's a common challenge for business owners, CEOs, HR/OD managers who want to bring coaching into their organization because the coaching industry is so fractured. There are many individual service providers but few coaching organizations that have a broad range of coaches to effectively match coaches and businesses (both large and small). As the largest network of professional coaches, Noomii is uniquely set-up to deliver the ideal coaches for your staff, whether they are sales teams, executives or front-line managers.